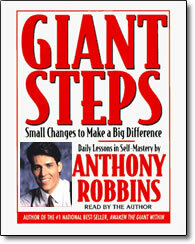 Giant Steps – by Anthony Robbins – book CDs MP3 – Discount! Small changes can make a big difference in the quality of our lives. Bestselling author and peak performance consultant Anthony Robbins delivers 365 daily lessons in self mastery based on the finest tools, techniques, principles, and strategies in his life changing book. Awaken the Giant Within. What good is inspiration if it’s not backed up by action? Anthony Robins offers daily inspiration and small actions—exercises—that will compel you to take giant steps forward in the quality of your life. From the simple power of decision-making to the more specific tools that can redefine the quality of your relationships, finances, health, and emotions, Robbins shows you how to get maximum results with minimum investment of time. This guidebook is designed to fit easily into your busy lifestyle by helping you turn these philosophies, strategies, and techniques into bite-sized chunks that you can digest in just minutes each day. It will lead you from the simple power of decision—a fundamental step in making any change in your life—to the more specific, precise tools that can define the quality of your relationships, your finances, your health, and your emotions. Use Giant Steps as a source of both inspiration and action to help you achieve the maximum results possible with the smallest investment of time—yet also give you a massive amount of collective information over the course of an entire year.